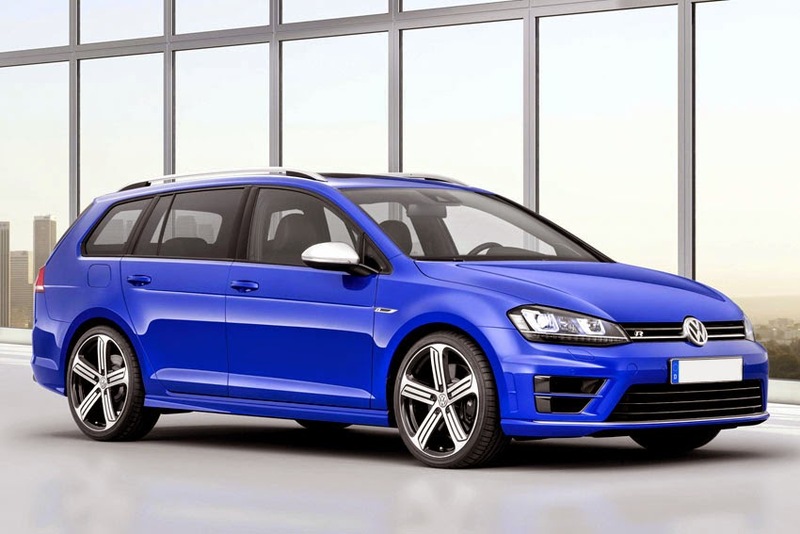 this is the first time that the Golf R has been developed in an estate bodystyle. Ensuring dynamic performance are sport suspension (lowered by 20 mm), Volkswagen's innovative progressive steering system and 'ESC Sport mode which can be deactivated for use on a race track if desired. Optional highlights include the newest generation of the DCC adaptive chassis control system with a driving profile selector that features a Race mode. The Golf R Estate's engine combines with these features to ensure safe but swift performance - standstill to 50 mph takes just 3.8* seconds, and to 62 mph 5.1* seconds, while top speed is electronically limited to 155 mph. Yet on the New European Driving Cycle (NEDC), the Golf R Estate consumes just 7.0* l/100 km - or 40.4* mpg - equating to CO2 emissions of 163* g/km. The Golf R Estate's design follows that of the Golf hatchback up to the B-pillars. It is then distinguished and stands apart from the rest of the Estate range thanks to a new R design bumper, a high-gloss black diffuser, four chrome-plated tailpipe trims, so-called 'aero flaps on the D-pillars, cherry-red taillights and LED number plate illumination. At the front, the Golf R Estate has an R specific bumper with particularly large air inlets, a distinctive radiator grille (with R logo) as well as bi-xenon headlights with integrated daytime running lights. The LED daytime running lights form a distinctive dual 'U' design beneath the dual headlights, projecting a particularly striking light pattern during the day and at night. R-style body-coloured side sill panels distinguish the Golf Estate range-topper, along with R logos on the front bumpers and matt chrome door mirror caps. Distinctive 18-inch 'Cadiz' alloy wheels are unique to R models, while black-painted brake callipers with R logo complete the look. Optional 19-inch Pretoria' flow-formed wheels (exceptionally lightweight and sturdy) in motorsport design are also available. The Golf R Estate makes its debut at the Los Angeles Auto Show and will be on display from November 18-30, 2014. UK Retailers are due to start taking orders for the new car in spring 2015, with first deliveries in the summer.